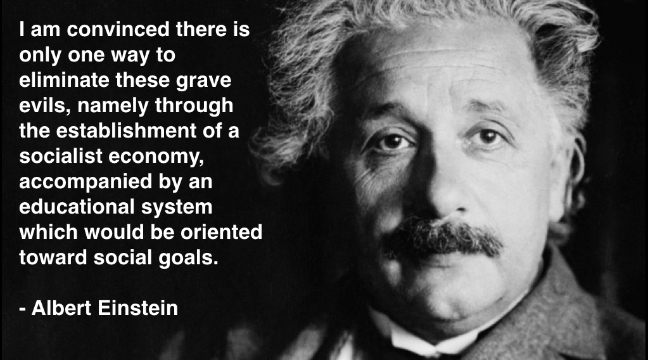 In May of 1949, one of the greatest minds on the planet, renowned physicist Albert Einstein, wrote an essay for the inaugural issue of The Monthly Review. In it, he outlines the crisis facing human society and enumerates some of the evils that are part and parcel of the capitalist mode of production. He then turns to discuss the solution. I am convinced there is only one way to eliminate these grave evils, namely through the establishment of a socialist economy, accompanied by an educational system which would be oriented toward social goals. In such an economy, the means of production are owned by society itself and are utilized in a planned fashion. A planned economy, which adjusts production to the needs of the community, would distribute the work to be done among all those able to work and would guarantee a livelihood to every man, woman, and child. The education of the individual, in addition to promoting his own innate abilities, would attempt to develop in him a sense of responsibility for his fellow men in place of the glorification of power and success in our present society. Read the full essay: Why Socialism?